Technology has truly evolved as years goes by, gone are the days where we use to take pictures and print it using films. Today, taking pictures and video taking your memories during trips are enhanced and updated with the use of drones. It is an amazing invention where you don’t even need to hold the gadget and capture the picturesque view of the place with you in it. Drones are electronic gadgets that you can manually control via a remote to capture your best moments in videos or in pictures. This tiny device is one of the best inventions that are released in the market and its super cool. You can experiment and explore your photography talent with the many updates engineered with in. However, there are many types of camera drones released and listing the top most desirable model is very hard considering the many features and assets each model has. But it’s worth a shot, so here is a list for the best drone cameras in 2018. What you get: Mavic 2 Pro. RC Cable (Standard Micro USB connector). RC Cable (USB Type-C connector). This DJI Mavic 2 Pro Drone is equipped with a Hasselblad L1D-20c camera with a 20MP 1” CMOS sensor. You will be able to capture amazing aerial shots in amazing detail and color with this quadcopter drone. This will let you check out the view for 31 minutes flight time at 44 mph maximum speed. It weighs a mere 907 grams during take-off. This quadcopter drone has an 8 GB internal storage but you can add an SD card to expand its memory up to 128 GB. Aside from taking cool aerial shots, you can also use this to capture live shots and photos. You can also enjoy its seemingly endless functions like ActiveTrack 2.0, Omnidirectional Obstacle Sensing, Hyperlapse, Low-Noise Design, Adjustable Aperture and HDR Photos. You can also bet that it comes with all the accessories and parts too. Everything you need to take this drone to flight the minute you get it home. Conclusion: The DJI Mavic 2 Pro Drone Quadcopter is a great drone with a very powerful camera and longer flying time. It lets you take stills, videos and live shots as well. It has all the features to better your flight experience and all the accessories and parts you need to fly it as soon as you take it home. In stock on September 26, 2018. What you get: Mavic 2 Zoom. USB Adapter, Spare Control Sticks (Pair). DJI Mavic 2 Zoom Drone Quadcopter. RC Cable (USB Type-C connector) | Gimbal Protector. Communication Cable (USB 3.0 Type-C). USB Adapter | RC Cable Slider (Large). 2x RC Cable Slider (Small) | Spare Control Sticks (pair). DJI USA Authorized Dealer Warranty. BUNDLE INCLUDES: 1 Year Extended Warranty..
32GB MicroSD High-Speed Memory Card. Deco Gear Drone Landing Pad 29.5″ Double-sided. Reflective, Ground Spokes, Carring Case. Deco Gear Large Photo/Video Backpack for DSLR Camera. Lens , Accessories , Folding Drones. VR Vue II Virtual Reality Viewer for 3.5″-6″ iPhone & Android. This drone is a powerful aerial tool with its CMOS 12 MP sensor, optical zoom camera and amazing precision in the air. It can give you up to 31 minutes of flight time in one charge at 44 mph maximum speeds. It comes with 8GB internal storage and SD card support that can expand memory up to 128 GB. You can also enjoy live view in real time plus you can record 4K videos at higher bitrates as well using its advanced H.265 compression rate. The DJI Mavic 2 Zoom has a variety of functions. It has ActiveTrack 2.0, Dolly Zoom, Omnidirectional Obstacle Sensing, Hyperlapse, HDR Photos and Low-Noise Design. You can the authentic Mavic 2 Zoom, an intelligent flight battery, gimbal protector, remote controller, 3x propellers, battery charger, power cables and communications cables to name a few. Everything you need to successfully launch your drone in the air once it arrives from the mail. Conclusion: The DJI Mavic 2 Zoom Drone Quadcopter is a superb flying tool that can take aerial videos, photos and live feeds. It comes with all the accessories and parts plus has new and better features compared to its predecessors. DJI Mavic Air Quadcopter with Remote Controller. Gimbal protector and spare control sticks (pair). Two RC cable slider (large) and two RC cable slider (small). 1 – Mavic Air Aircraft. 1 – Intelligent Flight Battery. 1 – Remote Cable Lightning for iPhone. 1 – Micro USB Remote to Smartphone Cable. 1 – C USB Remote Cable to Smartphone. 1 – Communication Cable USB3.0 type-c.
1 – RC Cable Slider Large. 2 – RC Cable Slider Small. 2 – Spare Control Sticks (Pair). 1 – 3.0 SD Card Reader. 1 – 32gb Micro SD Card. 1 – Micro Fiber Cleaning Cloth. Younger generations preferred to experiment and go on trips with cameras on their backpack. Cameras are always part of the travel plan and without it you cannot share your best moments in social media or pile it in a photo book. If you don’t want to be weighed down and continuously enjoy your backpacking trips, then don’t go without this gadget. Capture photos into the air using this 15.2-ounce black finished incorporating four side propellers with a base configuration on it. This drone has an engineered plastic body with portable and foldable features to ensure a flightless performance. It’s reinforced with magnesium alloy body that dissipates heat efficiently as needed. The device has a wide range 3-axis mechanical gimbal with angular vibration range reduced to 0.005 that captures pictures and videos using its 12 MP camera incorporating an HDR feature as needed. Nonetheless, it records 4K 30 fps shooting at 100 Mbps capturing UHD quality videos. It supports also 1080p 120 fps slow motion video capturing for full video coverage. It incorporates a foldable and ergonomic remote controller that could be used on maneuvering the drone. It supports 8 GB internal memory with a USB 3.0 and Micro SD slot to let you save photos and videos intuitively. The device is made with high-density lithium batteries that could substantially fly up to 21 minutes. The package of this box includes the drone, battery, power cable, and two extra blades. It incorporates a GPS navigation capability and Active Track Subject tracking modes to compose every shot and post it easily into the social media. Aside from that, the device empowers a 43 mph speed with obstacle detection for flexible utilization. Conclusion: This drone is a bit pricey yet very reliable in terms of features and functionality. Nevertheless, the GPS ability is quite weak with a non-weather resistant body not being able to handle extreme conditions. It has an innovative camera features capturing images and videos efficiently. Though few users have complaints about the customer service stating that it’s poorly done as it should be. DJI Mavic Pro Aerial 4K Camera Drone Bundle. Shoulder Bag & Prop Guard (Certified Refurbished). In combination with the Activetrack application, you don’t have to hold it wherever you go, it will follow you automatically. The drone can be connected to your iPhone and controlled by a remote so a better shot of the view will be taken. You don’t even need to be a pro to fly it, its application will do the work for you.This model can be packed and folded like small water bottle so whenever you go on trips, this won’t cause any hassle. This sci-fi like gadget made straight out from the movies has features that include OcuSync transmission system of about 7km transmission range. It can also fly as high as 40mph (64kph) or within 27 minutes range. With its futuristic design, it can surely topple every drone cameras in its category. This drone camera is considered as a technology breakthrough invention that can be pack anywhere you go like small bottled water. To top it all, this is systematically programmed with the necessary safety features like obstacle avoidance and sensor redundancy specs. With that in combination, flight safety is completely achieved. So DJI Mavic Pro is still a best drone for 2018. And we will update asap when the new version released. Let’s check the comparison of DJI Mavic Air Vs Mavic Pro Vs Spark. Conclusion: The first thing that is very notable about the Mavic Pro is its size. The whole thing is smaller than the control console of the Phantom 4. This drone is what we can consider Hi-Tech if it can fit in your pocket without any problem and still perform the functions it promises. It is lightweight, and ironically, it feels solid as a rock. You don’t get this feeling that this is a toy, rather a militaristic gadget from the future. Also, since you can fit this drone inside a pouch, it costs less that the others in the market but is a rival to any and all drone units to date. The DJI Mavic Pro the materialization of ingenious design and powerful performance. ANAFI EXTENDED, TO GIVE YOUR PACK AN EXTRA BOOST: With the Extended pack, you won’t be missing anything. It features a compact carrying case. 16 GB micro SD card. 2 months access to the Adobe Creative Suite Cloud. spare remote control and propellers. Parrot’s Anafi drone in dark grey shoots HDR videos in 4K and captures photos at a resolution of 21 MP. We think these are quite satisfactory in comparison with features you can find even in some more expensive models. It comes with its own controller, which is foldable. A unique feature is its 180-degree vertical tilt gimbal. This design feature is highly beneficial and will help you a lot in capturing and shooting low-angle shots. We like this feature because it substantially increases the versatility of the drone in our opinion. We also like the carbon frame. It seems to be very sturdy and built to last, but the weight remains very much tolerable. The entire drone is also very portable, and it folds and unfolds quickly (3 seconds, according to the manufacturer). It also has a USB-C smart battery, and the flight time is 25 minutes. Software features include Geofence, which prevents the Anafi from venturing outside of the allowable area by allowing you to define your virtual perimeter. We also have not heard anything too concerning about it. There are just a few reports of the item getting damaged easily or arriving damaged, but they may be isolated incidents. Conclusion: In general, we think the Anafi offers good value for money and may even be a worthy competitor to some more expensive drones on the market. First, it is very light and easily portable. As stated by Parrot, the drone should be ready in 3 seconds. The zoom and the quality of the video are also fantastic, especially considering the price. We would recommend this to anyone wanting a good drone to play around with or use during travels. The DJI Phantom 4 Pro is a well-designed companion to the Phantom 4. True to its name, this model does come with premium features that will serve you well if you are serious about venturing into drone photography. The Phantom 4 Pro has good automated features and controls and an impressive maximum speed. You can buy this drone with either a standard controller or a high-luminance display controller. It is fitted with front, rear, and underslung sensors that help prevent collisions and allow for safe landings. These sensors are located in the drone’s legs. The sides of the drone have infrared and optical sensors. The Phantom 4 Pro uses an infrared system to determine location. It also features a neat return-to-home mode that has an impressive range of 300 meters. The entire unit is lightweight enough to be easily and comfortably carried around. Assembly is not an issue as you simply clip the propellers to the motors. What may be an issue, though, is portability. The Phantom 4 Pro does not collapse. The arms and propellers do not fold down. The landing gear is not retractable. If you are wondering about battery life, it ultimately depends on which features you are using and how you are using the drone. However, with normal use, you should be able to squeeze an average of 30 minutes worth of flight time out of it. Like other drones, the Phantom 4 Pro has the standard and common orbital and follow modes. What sets it apart, though, is its set of automated features. The subject tracking feature is called ActiveTrack, and it lets the drone follow its subject in Spotlight mode. It tracks by flying either sideward or backward. Another nice automated feature is the conveniently labeled TapFly mode, which lets the drone fly toward any area you tap on the screen. This feature works even when the Phantom 4 Pro is flying backward. Moreover, you can rotate or tilt the drone and the camera and the TapFly path will not be affected. DJI also included a nice feature intended for users with less experience in drone photography. It is aptly called beginner mode and limits the drone’s speed and steering when activated. At the same time, there is a sports mode, which allows the Phantom 4 Pro to fly at up to 45 mph (72 kph). Conclusion: In summary, the Phantom 4 Pro definitely deserves to be labeled an upper tier camera-equipped drone. From assembly to operation and maintenance, this model proves that it is worth investing in. The unit is easy to put together and the controls are user-friendly and easy to manipulate. The Phantom 4 Pro’s automated features are intuitive, well-designed, and advanced in function. You can say that this model is geared toward intermediate and advanced drone photographers and hobbyists, but DJI does have a feature intended for those who are a bit new to drone photography. In the Box: Aircraft Body 1. The model offers the best flight control among drone cameras plus the built in magnesium core increases its agility. The safety software geared in, in the drone increases the speed by 25%. This truly brings the ultimate thrill of speed and excitement. The obstacle sensors are connected with an advance software system that allows better vision and reaction processing to obstacle avoidance on its path. The drone might be bulky to look at but because of its magnesium skeleton, weight is minimized and stiffness is kept to minimize vibration. The design is highly updated with the center of gravity maintaining the balance, precision and agility. A clear and picturesque shot is accomplished because of its f/2.8 lens that accommodates a wide view of the area. The Gimbal technology is built in for better stabilization control and hover functioning. The sleek appearance and aerodynamics makes this drone camera envy to many. The DJI Phantom 4 model reacts well with touch. The TapFly mode, once connected to you smart device displays the flying direction plus in conjunction with the sensors, you can fly it with no worries at all. This drone camera is a good candidate for the competition making it a good rival for the Mavic Pro which comes from the same manufacturer. Its specs include auto off/return home system powered by a GPS technology for good navigation control, and 4K ultra HD video at 30 fps for picture and video taking. With its bulky and huge design, stability and flight safety is surely guaranteed. It may not be a portable type but this is engineered with good technology and powered with lots of navigation application. Conclusion: If you are planning to get a drone, and this is your first time getting one, then the Phantom 4 is the drone for you. The controls are straight forward that even a five-year old can fly this drone. It is one incredible piece of technology that you shouldn’t pass up. But it definitely makes up for those quality videos that have more crisp than the rest of the competition. The best part is that the DJI Phantom 4 boasts about 28 minutes of flight time. That’s half an hour of epic aerial shots that nothing but mind-blowing. DJI Inspire 1 V2.0 Ready-to-Fly Quadcopter. Remote Controller – Camera with Gimbal . Intelligent Flight Battery (TB47) . ND Filter – Manuals . Remote Controller Charging Cable . Camera with Gimbal Box . Unleashed your inner creativity and practiced your cinematic talent with the use of this aerodynamic technology advance drone camera. This type of drone can be controlled with one or two controllers, but it depends on the user whichever he prefers. Via DJI Lightbridge, you can do a wireless, live HD video transmission accompanied with its 360 degrees unobstructed shooting. The gadget offers its customer unparalleled satisfaction when it comes to perfect aerial photography and cinematography. The gadget is specifically made for that function along with its 3-axis gimbal stabilization technology. The outer appearance of the drone camera is perfect and stylish compared to other models. The video quality produced by the drone is overflowing with color, sharpness, and quality. However, customers might think twice when buying this product because it is a bit pricey, if you opt for 2 controllers, then you might need to think carefully of your budget. Professional level is achieved if you have the right gear for the job. Even novice individual who takes filmography as a hobby can do well if the gadget that they got is perfect for the field work. DJI Inspire 1 drone camera by no means the best device for a perfect high-level shots and HD quality videos making. This model is the first fully integrated aerial drone that is geared with only M4/3 camera specifically made for aerial view shots and imaging. It is made with advance technology that allows you to capture the impossible. Conclusion: This UAV is the first one to sport a dedicated flight camera that can deliver to you 4K (4096×2160 at 30fps) still shots and videos. This is a drone that is always ready to fly. If bulky drones aren’t you’re thing, then DJI Inspire 1 will not disappoint you with its super lightweight design (even with batteries on). It is especially awesome to watch as is takes off because it transforms mid-flight as the wings fold up higher to get that perfect 360 angle. It doesn’t have problems in high altitudes or strong winds. We like how all the shots are level, and the horizon is always level. 2 full sets of propellers. You can now enjoy the thrill of having to fly with speed and precision. Go high and up instantly with Phantom 3 model. Fly with no hassle and worry because this guy can go back whenever you want at one press of the button. The GPS technology designed within it makes it a superb choice for a back packing trip as it will automatically go back to you if the signal control is lost. The auto-hover system allows the drone to stay in place holding its altitude and position in mid-air. At the flick of your finger, you can change its direction. Video recording in HD quality is applicable with its 4K camera and 720p video. For safety purposes, you can also adjust the setting to fly it at a within a safe flight height. Unlike other products the drone is compatible with iPhone and android phones. It is also equipped with a real time monitor that signals you if the battery is running low and how much longer it can fly. Much has been said about the Phantom 4, a slightly different version of the Phantom 3. DJI Company has bought and produced a lot of drones and each of them significantly made an impact in the market with its variety of specs. This type of model is a lesser version of the Phantom 4 but considerably a different type. Nothing much has change with its appearance aside from the addition of the gold design on some of its parts. However, when it comes to specs, this type surely has its own advancements. Conclusion: The DJI Phantom 3 is the good example of next-gen technology and standard quality photography done right. It is quite the dated model, but if all you want is to get aerial shots of your neighborhood or simply pass time while impressing friends with a piece of tech—the Phantom 3 is the way to go. It is simple and direct from the design and function. With UHD 4K/30fps video and about 23 minutes of flight time, everything fun will be captured by this drone. As a bonus, a robotic female voice will sound off as you activate the easy auto take-off function. Advanced 5G 1080P FHD Camera: The upgraded camera with 110°FOV (field of view) lens gives a panoramic view for recording your unforgettable moment. 5G 1300FT transmission ensures high-quality real time video – ideals for selfie. GoPro Hero 2/3/4 Compatible! Simple Control: Quick launch by pressing one key; quick-Release propellers can be set up with no screws; stable flight while keeping its altitude locked; easy direction control with headless mode. You can focus on camera control and more complex shots. Transmitter is underneath the package. Be careful when take the package out from box. This drone from Holy Stone is within the average price range, and we think the features justify that. This quadcopter has live video and GPS “return home” functionalities, as well as an adjustable wide-angle 720p HD camera. Other features include a long control range, intelligent battery, altitude hold, and “follow me”. Auto return means the drone will return to you on its own when it loses signal or begins to run low on battery. This works hand in hand with the GPS feature, and together, they ensure safe flight and prevent loss of and damage to the drone. There is also a “quick launch” feature, which actually covers one-key take-off and landing. The drone also has an emergency “stop” button. We find these very intuitive and valuable especially for those who are new to using drones. Meanwhile, the altitude hold lets you lock the drone at a certain height in flight. This lessens worry whenever the drone ventures out of your sight. You do not have to fear that it will fly into or hit something if you can lock the unit at a seemingly “clear” height. The only downside we have noticed so far is that it can be quite difficult to get a hold of customer support, which means you may have a hard time getting parts replaced, for example, if needed. Conclusion: Overall, we like this drone from Holy Stone. We think its features can compete well with and may even be better than those of many other drones at the same price point. You will appreciate how it remains stable and responsive regardless of where you take it within the specified range. It is safe to say that this is truly a great drone with many uses. BONUS BATTERY TO DOUBLE YOUR FLYING TIME: Equipped with two large-capacity batteries which can last up to 10 minutes on a full charge, giving a longer flying time than compared to the industry average flight time of 6.5 minutes. Capture landscapes and beautiful sceneries through this HD camera drones. This has a 720p HD camera that allows you to take images and videos whatever angle and perspective you want. It has easy remote controls that are highly transmittable for about 80-100 meter distances. These drones could be attached and gripped on with compatible Android devices including iPhones. It takes a good track to real-time aerial views via WiFi through downloading its mobile application. It has four circular propellers and body that is made to resists weather disturbances and strong impacts brought by uncontrolled occurrences. It flies over easily with its headless mode to compete for the drone experience without losing it within your sight. This WiFi drone is extra powerful with its high capacity battery that could last up to 10 minutes. 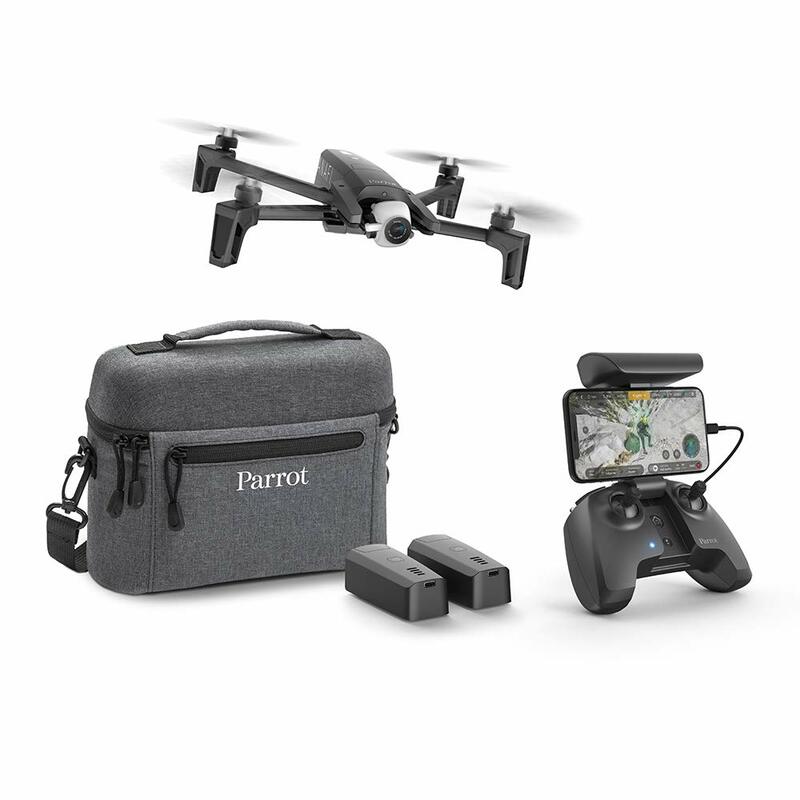 The drone package also consists of four spare propellers, a user manual, a USB battery charger, 4GB microSD Card, Card Reader, and Extra Batteries. Conclusion: An affordable and best-selling drone that has multiple great reviews from its users. The drone offers quality surveillance video and image capturing system via WiFi to keeps you on track regarding what’s happening from above. Also, you could easily grip on and take aerial selfies through your android devices. The product is highly durable withstanding even extreme weather conditions. Instead of the home return button, the drone has a headless mode for easy maneuvering. Nonetheless, it does not have a protective case and an altitude hold for tracking and protection. Its controlling system is not highly calibrated and that sensitive making every hover difficult and unreliable. For concerns and problems regarding the product, you could easily give a call and reach immediately to their customer service. They offer replacement and warranty for their products. But overall, these drones are perfect for beginners and even for children! Fly and capture wherever you want. This drone incorporates a premium and high quality 720p camera and video that captures 120-degree wide angle views and perspectives. It is heavily constructed with industrial strength materials consisting of a body and four branched winged propellers to allow flying over long distances. It stays detectable for about 100 meters with altitude hold and headless mode for easy flying. For emergencies, this drone incorporates an out of range alarm, low battery alarm, and emergency landing function for convenient utilization. The camera is compatible with Android devices to aid in capturing and maneuvering without using a controller. Its battery capacity lasts about 10 minutes. It is usable even at night powered by LED lights for easy vision. The packages come with a USB charging cable, a memory card reader, two batteries, and an English manual or guide. Conclusion: A medium-sized drone that is quite handy for traveling and surveillance to long range distances. This drone is absolutely perfect for beginners who want to use easy control with user-friendly interface controller. The drone has a lot of features including emergency alarm systems during low power, out of range flights, and unintended landings. The drone is quite durable with a quadcopter and high-end design. It captures nice photos and videos using its mobile application. Though, it would be nice if it takes pictures without the use of smartphones. For its price, it would be good to include a GPS system for easy tracking. Its battery’s lifespan is quite different from the 8-10 minute that the company advertises. It’s better to give the manufacturer a call to get inquiries regarding some problems. The company purchases spare batteries, chargers, and parts for those who want to replace it. GoPro Company is the leading industry for active video taking but took its chances and releases the GoPro Karma. When it was released, all eyes are on it but the company nailed it once again, the speed features, software, agility are topnotch. This model is also a backpack buddy; it can be reduced to a much smaller size thanks to its foldable wings. Even if it is handheld or body mounted, it captures an HD like footage and picture. When in mid-air, it captures a magnificent shake free view of the area. The package includes a Karma Grip where you can mount the GoPro after releasing the Karma Stabilizer for a professional like handheld shots. First time flyers won’t have to deal with the flight worries because the manual is easy to understand and the gadget itself is easy to operate. The flight time is limited to only 20 minutes and charging time is about 1 hour for the battery. It is also suitable with Hero 5 and Hero 4. When drone cameras are released, one of the best models introduced is from the GoPro Company. When you talk about active video recording and picture taking, nothing beats GoPro models. The specs are well designed to attain a true 4K video recording quality. Other companies may attempt to release the same type of drone camera, but nothing beats the original. Features and software are technologically driven and systematically calculate to raise the bar for drone cameras. Conclusion: If you’re one of the many who belong to the Go Pro nation, the Karma will fit right into your style. This drone doesn’t have a built-in camera because it uses the Go Pro you are currently using. It has a compact and lightweight design that’s been marketed by the Go Pro world. The user interface is very straightforward. With the GIMBLE in place, all shot the Karma takes is steady and amazing. This is the best partner for your Go Pro. This robotic like drone has a flight time of about 22 minutes maximum. Its arms are integrated with LEDs for a trouble free navigation and directional management. The remote controller has its on screen telemetry that displays an instant data one you start its engine. People usually expect less from this model because it is not equipped with lots of software like other types. However, this also have high end features similar to high end drone cameras. Easy to operate and the aerodynamic feature is systematically programmed to fly high like other drones. With this drone, it might be possible to capture a high quality video or picture because you can attach a high end type of camera like the GoPro camera. It may be cheap but it can do many things other drones can’t. The package also comes with a 4GB memory stick, spare battery, and replacement propellers in case the original gets damage. The accessories are sold separately but can be installed and it is compatible. It is also automated with a Gimbal tilt control for easy flying and has a return to base type of software as well. This might be the cheapest type of drone camera for it is not built with a camera in it but rather allows you to mount any type of camera like GoPro. It might be a less version of the DJI but it has its own beauty and good specifications. Well, the appearance is simple and robotic like the name suggest. At first you may find this an average type considering the looks but mind you, the appearance does not matter, the features are well integrated with each other. Conclusion: What makes the 3D Robotics Iris+ a cut above the rest is it’s Follow Me feature. This is great news for all travel bloggers and outdoor enthusiasts. If that doesn’t do it for you then the Auto Pilot will make you grab one of these drones. With this feature you can set way points, course a flight path, control the altitude and it will even land on its own without crashing. A Go Pro can also be mounted on this drone that will go well with the Gimble. This item does not ship to Australia. Please check other sellers who may ship internationally. This may be an ordinary model compared to the classy GoPro and DJI types but it’s a guarantee that you would not regret purchasing this. Not many drones have features that allow you to mount a camera. With this guy, it is possible to take an HD 4K quality video film and photograph. It is armed with Gimbal stabilization technology that improves the balance and stability of the gadget on mid-air. The GPS technology tracks the location of the user and maintains contact via the remote control with telemeter, with this feature, the drone can safely return home to its original position. The product weighs about 3.3 pounds with a dimension of 18 x 18 x 10 inches making it the smallest drone camera. This is powered with two 1 GHz computers that enable a good and smooth aerial shot experience. To top it all, this is the only drone that is compatible with a wireless video streaming with an HD quality film with your GoPro directly connected to your mobile device. Other than the GoPro and Dji, there are other model drone cameras that exhibit a stupendous performance. People don’t know much about them because they are shadowed by the popularity of big company drone models. Nevertheless, this type of drone camera has features similar to that of high end drone cameras. This is not built with camera but cameras with HD spec can be attached. The black sleek outer frame is industrially designed to look marketable. Conclusion: This is a drone will not crash even if you do. With two computers installed—one in the drone and one in the controller—this is one of the smartest UAVs out in the market. We want Hollywood-grade footage and this drone gave it to us perfectly. It takes off and lands with just a press of a button. The SOLO is the first drone that has full integration with Go Pro so you get access to all the controls of that amazing camera. The drone is introduced to the public as a toy helicopter but it’s not just a toy model but rather a slightly less version of drone cameras. This toy model has an intuitive piloting that can be controlled with your smartphone or tablets via wireless syncing. Take a try and experiment the many wonders it can do. Execute acrobatic moves and perform in public, flips and barrel rolls while tracking location, photos and flight data. It is capable to receive a 720p high definition video streaming through your smartphone during flight mode. The AR. Free Flight piloting app allows you to record and shares video. The build quality is of different league, it is made with nylon, carbon fiber parts and its brushless motor is very reliable and sturdy. Accessories are not included in the package but you can opt to buy them. A flash recorder compatible with the drone can be connected like a USB that allows you to record footage directly. It has a 4GB memory and also a GPS receiver. Despite its awkward appearance resembling a saucer like appearance, this drone is apparently marketed as a toy drone and not specifically made for filmography use. With that being said, you can pretty still have fun using this drone provided that you charge its battery. This might not be compatible to capture a 4K quality picture but you can still manage to take a good aerial shot of your view of choice. Lastly, this is not controlled with remote controls but may require you to get a Nvidia Shield. Conclusion: The Parrot AR is a drone you can really play with and a have lots of fun. It flies really well, and better that the rest in the market because all four of its propellers are equipped with independent motors. We like that option of having and front facing camera and a 90° downwards angle camera. The cool this about this drone is that it is the only one AR integration for AR games you can download. The two navigation sensors at the bottom keep the drone level while in flight. The product ships with all relevant accessories. It is safe to assume that the basic feature of this drone model is clearly a good candidate for competition. This peculiarly looking yet stylish model of drone is integrated with 3-axis precision Gimbal camera. The package also comes with a handheld steady grip for capturing video footage. If you find white color painted drones because of what the market displays, then you can buy this drone camera that comes in black, sleek color. Budget wise, this drone type can solve your money issues because this can really get you a good run of your money. Unlike the classic ones marketed by GoPro and DJI, this is considered a cheap model. However, this model has features that can capture a 4K/30fps ultra high definition video or a 1080p/120fps slow motion video. The package comes in with 2 batteries, 2 sets of propellers and a storage case to hold everything. Once combined with an iPhone or an android phone, you can shoot completely and control the camera works. The controller is done dealer because it is built with 5.5-inch touch screen display instead of relying on smart phones for live view. This drone camera is not a GoPro or DJI line up but of a different brand. This might not be as good as the aforementioned brand but has lots of quality features. The model is geared with buttons for starting/stopping video recording and capturing pictures. Its settings even allow you to move to different flight modes like Smart, Angle and Home. This is a good alternative if you’re budget is not enough for the GoPro or DJI types. Conclusion: Photographers and videographers who are finding it hard to get that heroic aerial will find this drone as a life saver. The Yuneec Q500 4K can take landscape shots using Gimble like you have never seen before. The remote has an integrated touchscreen so you don’t need a smart device for controls. Simply pressing a button will make it fly and land with no problems. The best part is this drone has a 12.4MP camera with 4K at 30fps. Advantages of The Best Drone Cameras? Drones can fly in to areas that huge planes cannot. It can take footage from a few centimeters off the ground to 400ft. Aerial shots are taken fast and easy with the highest quality of videos. It launch and land in no time at all without wasting precious seconds of that perfect shot. Helicopters that were once used for aerial shots for weddings or construction emit a lot of carbon. Drones don’t do this to the environment because they run batteries. Mavic Pro vs Phantom 4 Pro vs Inspire 1 Pro – Which One to Buy? One of the standout features of the Mavic Pro drone is portability. Rather than creating the manufacturer standard space-hogging and fixed-arm hull, this drone features an interesting array of folding arms, as well as props that allows the drone to easily fold into a neat package which is about the size of a usual brick. With its compact controller, the Mavic Pro has turned out as among the most portable drones ever designed. Upfront, this model comes with a 4K camera, as well as a super compact 3-axis for its gimbal design. This enables the device to easily capture amazingly stabilized video images without any cutbacks in resolution needed for digital stabilization. On top of that, behind the camera features, this drone also operates using the Optical Flow software and DJI’s ActiveTrack, allowing it to easily track objects, while sensing potential obstacles using its camera, as well as its image analysis algorithms. Both range and flight specs are also impressive too. The manufacturer has equipped this drone with a video transmission system referred to as OcuSync, stretching the max range of Mavic Pro to more than 4 miles, while boosting its overall resistance to potential interference. On the other hand, at shorter ranges, this technology even has the capacity to stream footage at 1080p resolution, allowing both video and photo downloads at 40 mbps. When it comes to quality of build and design, DJI also deserves a lot of praise. It is brilliantly designed. Folding of this drone is brought to a higher level. With its amazing hinge system, the arms easily fold into a little package which is smaller compared to that of an average brick, making it easy to store inside your messenger bag or backpack. It can even be fitted inside a purse. Another element in design that is well-loved by drone enthusiasts is the use of its portable controller. It is not small enough like that of a weak smartphone app, while it is not a huge ground station which may consume a huge space in your bag. Overall, the design has been well-thought of, designed as a hybrid model that allows you to fold it up, or in full frame after flipping out the antennas. One thing to watch out for, however, is its 3-axis gimbal design. While it is impressively compact and small, it is being held in place using 4 small rubber bands which tend to be fragile. If a rubber band snaps, the camera may have problems stabilizing itself. Aside from this flaw in design, other things are designed to last. This drone model delivers amazing results and is highly entertaining. However, you may not be able to expect a lot out of it if you need professional control. Among the capabilities of this model includes the use of a one-inch 20 MP camera which has the capacity to shoot 4K 60, bursting photos at 14 FPS. Another feature it offers is the use of a 5 directional obstacle sensing which keeps the drone right in the air even though there may be potential obstacles along the way. This is a huge improvement from the four directions offered by its sibling, the Phantom 4. It works together with the Active Track software that allows the drone to focus on a specific subject in a number of ways, allowing you to do some maneuvers which may take both skill and repetition. And if you want to protect your drone from losing, then check out this review list of the best drone trackers. Among the other upgrades is the integration of an improved battery and lighter body which in turn, extends its flight time up to 30 minutes. The manufacturer also seems to see the benefits of the GoPro book by including a monitory display with a remote for this model. Its ultra-bright screen allows for better viewing even under direct sunlight. This is a problem that is usually encountered by most users. The Phantom 4 Pro is regarded as an evolution of the Phantom 4, boasting significant improvements in this model. The use of a 1-inch image sensor can be described as four times the actual size of the Phantom 4 model. The manufacturer has also decided to introduce aperture control, as well as a mechanical shutter. This new camera is better, bigger, and far more customizable. When it comes to design, it is closely similar to the original Phantom 4. The same hull shape is retained, with slight differences in the location where the sensors are placed. The extra sensors are now attached into the legs of the drones, while both optical and infrared sensors have been fitted to the left and right sides of the drone. Even the camera is a big larger compared to the original size. The only opportunity for improvement in this model is that it lacks portability. The props and arms cannot be folded down, while the landing gear cannot be retracted or collapsed. Obviously, portability is not in its design, even though it is still small enough to be stored inside your backpack when needed. The Inspire 1 Pro drone can be quite intimidating to the hands. It comes with dimensions 16 x 16 x 12 inches. This only means that it is a huge piece of equipment. It uses the latest Zenmuse Micro Four Thirds sensor, alongside its 15mm feet/1.7 lens that is capable of capturing clear 4K video as well as high-definition images. Among the standard capabilities of this model includes the capacity to travel at 50 mph, fly even in freezing temperatures, as well as the capability to ascend to a height of 15,000 feet. When it comes to design, this drone comes with a main housing that comes in a stark white color, featuring an aerodynamic design. With this model’s remote focus features, you can take full control of your camera focus. Combining this feature with the aperture control, you can expect a higher level of creative freedom. With remote focus, you can also simply tap the screen inside the GO app. You may even turn in a dial, similar to that of turning a lens for a better control. The use of Zenmuse stabilization system incorporates an interior high-grade design of magnesium alloy which comes as a result of the manufacturer’s research as well as professional level study. On top of that, the use of a 3-axis gimbal design, this drone can hold up well despite a windy situation, keeping the camera right in place without risky movements. Individuals who will end up preferring the Inspire 1 Pro model will likely be those who need to perform professional aerial shots. With this, you have the option to buy dual controller systems. However, if you just use this model for leisure, a single controller will do the job well. While you can easily fly this drone using its joysticks, you can explore its touch screen in order to pan in the view of the drone. Overall, the Inspire 1 Pro is an amazing professional equipment. This is ideal for cinematographers, as well as those who can afford its price. Among the three models presented in this guide, the Inspire 1 Pro offers the most advanced features. To summarize the features and capabilities of each model, there are some features that you need to remember. The Mavic Pro is similar to a high end quality of smartphone. It comes with amazing quality, and feels great to the feel. However, if you are a keen observer of technical camera features, you will notice its lower quality of sensor. The Phantom 4 Pro is similar to that of an entry-level DSLR camera. This means that you can expect creating a professional image output with this model. On the other hand, Inspire 1 Pro can be regarded as a high-end and full-frame DSLR camera. This means that its quality is highly professional. This also means that it can be more difficult to use, and relatively more expensive. You can expect, however, that it offers the best quality of image. Final Verdict: The type of drone to choose depends on your purpose of use. If you are a standard hobbyist, the Mavic Pro might will work well with you. On the other hand, if you are looking for professional output at a relatively affordable price point, the Phantom 4 Pro is a better option compared to the Inspire 1 Pro. However, if you are looking for the best quality features that produces professional quality output, no doubt that the Inspire 1 Pro is the option to go.